You know how on airplanes, everyone around you orders ginger ale to drink? I know that people aren’t drinking that much ginger ale in their day-to-day life on the ground. But ginger ale is such a popular airplane drink because ginger is famous for settling upset tummies, and between the stress of getting to the airport on time, the greasy airport food, and the actual bumps in the air, flying can leave many people feeling a little off. Ginger ale has always been one of my favorites–usually a treat reserved for traveling and the kid’s table at family holidays. As I mentioned previously, though, my husband recently got me a juicer and I decided to experiment with a homemade version. It’s really simple to make and it tastes like a spicier, more refreshing version of the real thing. Plus it’s full of real ginger–so much of it, that I can literally feel my tummy tingling (in a good way!) when I drink it sometimes. 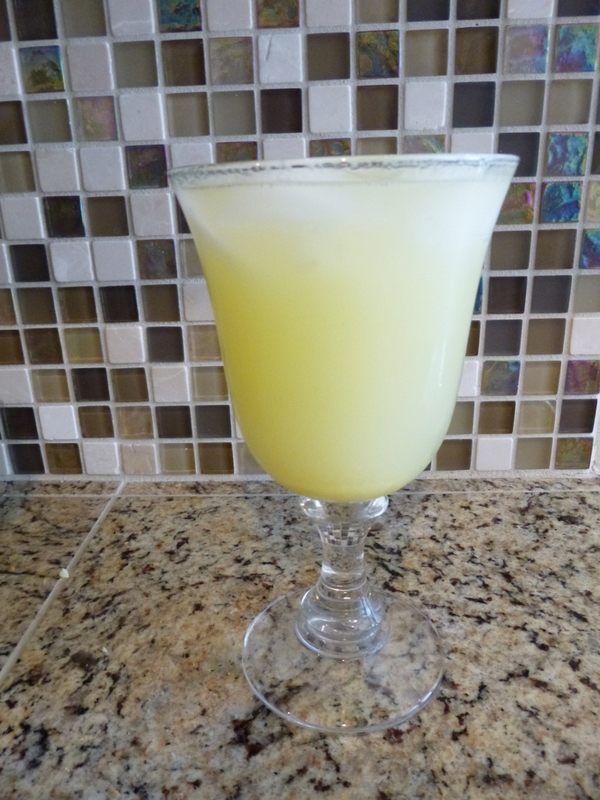 Try the recipe as is the first time, and then you can adjust to your taste. 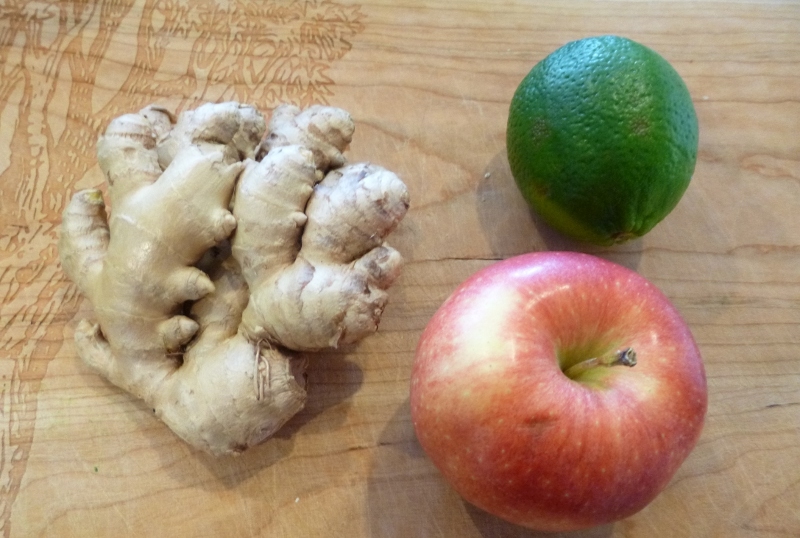 Use more ginger for more spice, more lime for a tarter drink, or more honey if you like it sweeter. For reference, this is the piece of ginger I used. You’ll end up with a super-concentrated syrup that looks like this. And this is the final product. So refreshing! 1 big piece of ginger. No need to be exact here; just choose the largest, freshest piece of ginger root you can find in your grocery store. That’s probably the right one for this project. Pour the fresh juice into a small saucepan and add honey. Bring to a roiling boil and let boil for 2-3 minutes. Pour into a jar. Stir syrup into sparkling water. Start with about 4 teaspoons of syrup per cup of sparkling water; add more until it is the right strength for your taste. Save the remaining syrup in the refrigerator and enjoy within a few days. I haven’t blogged in a while primarily because I recently got both of Danielle Walker’s fabulous cookbooks and I’ve been cooking everything in them. I’ve been eating lots of good food, but none of it has really been original. If you are paleo or SCD, I can’t recommend her cookbooks enough. Her recipes have never failed us! However, all of our feasting came to an abrupt halt when my GI doctor put me on a round of hefty antibiotics because he was worried I was forming a new abscess. While he was encouraged by my progress over all, ramping up medication always feels like a bit of a failure on my part. It’s easy for me to start thinking, “did this happen because I let myself get too stressed,” or, “if I hadn’t eaten out that one time a couple weeks ago, would I be feeling better today?” I’ve been learning about meditation and mindfulness, because it is one of the things that people with chronic illness report as being most helpful to them, and I’ve been reading about just how self-destructive these kinds of thoughts are. It is better to react to setbacks with self-compassion and equanimity since we can never know for sure if there was anything we could have done to alter the outcome, and allowing negative and stressful thoughts to control us only further exacerbates both physical symptoms and mental suffering. So I’ve been working on that during this round of treatment. Anyway, the antibiotics make me so nauseous I can’t even stand to look at most food–much less cook it and eat it. Plus, my GI doc stressed the importance of probiotics while I was on the antibiotics, so I started drinking most of my meals instead. 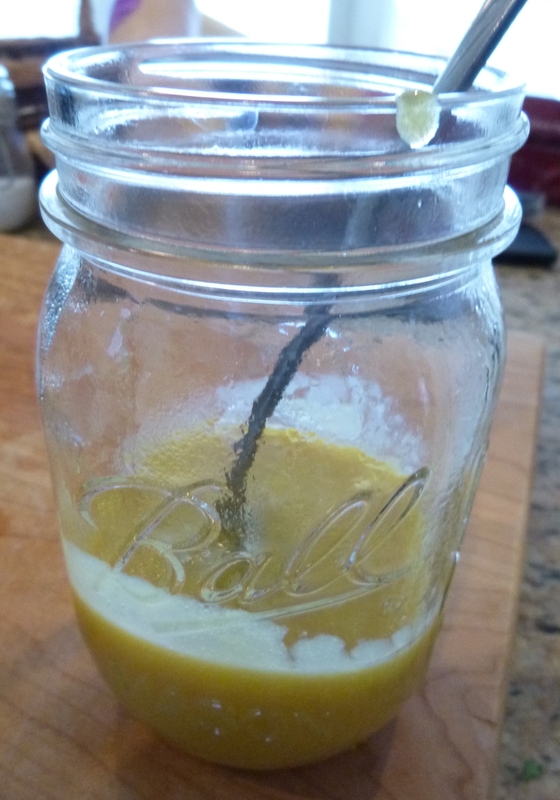 I’ve been making all kinds of smoothies, often times with some hidden veggies or a raw pasteurized egg blended in so it makes a better meal replacement, but the following recipe is my absolute favorite–light and easy on the tummy, and it even helps those of us who are still dealing with summer weather get into the fall spirit. It tastes way better than a pumpkin spice latte when the AC is still running! 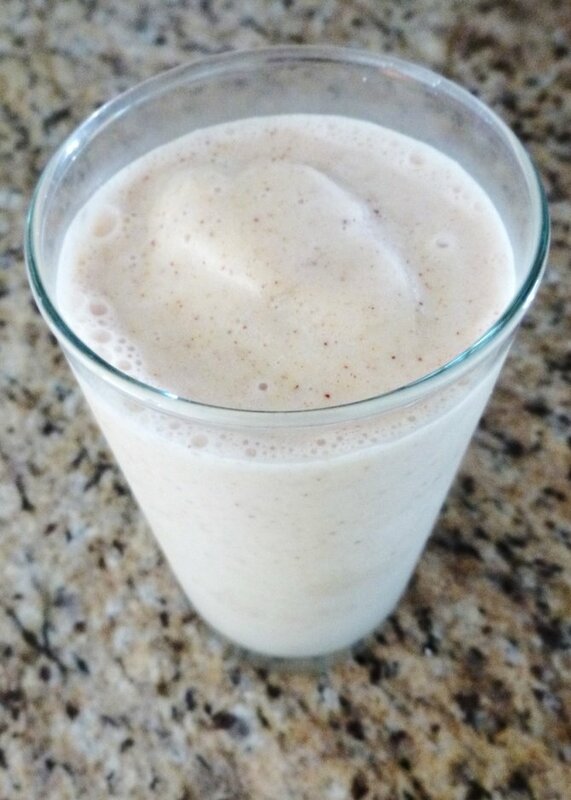 Place all ingredients in a blender and blend! If it’s too thin, add a few more chunks of banana or ice cubes. If it’s too thick, add apple juice until it blends easily. This makes one large meal-sized serving, or two generous snack-sized portions.